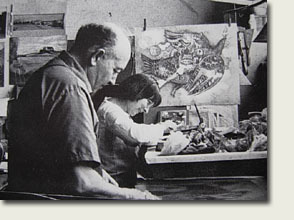 - Françoise Deberdt was born the lst July 1934 in Donnemarie en Montois (Seine et Marne). - From 1948 to 1954 she visits the "Ecole d'Arts appliqués" in Paris, leaving it after graduation. - During one year she studies glass painting and engraving technics at the" Atelier d'Art sacré" in Paris, hereafter she studies at the "Ecole Nationale Supérieure" of "Beaux Arts" in Paris in the workshop of Legueult, Section of painting. - ln 1959 she leaves Paris in order to learn pottery in "La Borne" (Cher). - ln 1960 she marries Jean Claude Bernard, 1st "Grand Prix" of Architecture, leaving for a 4-years' stay in the Villa Medici in Rome. - ln 1961 birth of Jacques. - ln 1962 birth of Valerie. - Françoise Deberdt profits from her stay in Rome to im¬prove her skill in the engraving technics while she continues painting. - Since 1957 she participa tes in numerous "Salons" and group exhibitions. - Editions of her engravings in France and abroad.